The photoreceptors in our eyes are ciliated cells. Cilia are (usually) thin structures that project from the surface of most cells in the human body and are thought to play important roles in sensing the environment of the cell. Our vision begins when photons (light particles) are captured by proteins called rhodopsins that are found in the photoreceptor cilium. Cascades of molecules in the photoreceptors then convert the photon into an electrical signal and pass it on to the brain where our perceived images of the world are formed. So without photoreceptors or their cilia we cannot see. 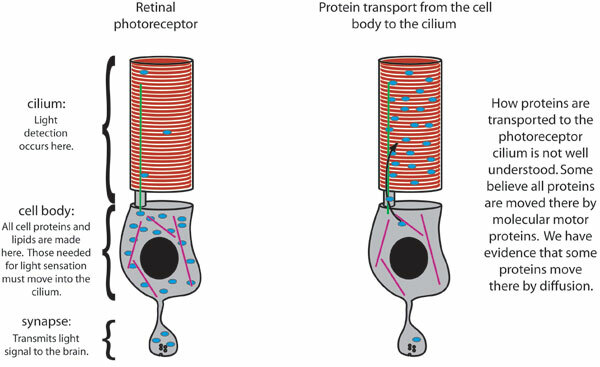 The cilium of the photoreceptor is not able to make its own proteins or membranes, so everything that is needed for converting photons into electrical signals must move from the cell body, where they are made, into the cilium, where they perform their function. How this happens is not well understood, but we do know that when something goes wrong with this molecular movement, loss of vision is often the result. There are many examples where genetic mutations that appear to interrupt transport of molecules in photoreceptors lead to diseases causing vision loss, including retinitis pigmentosa, Leber congenital amaurosis, Bardet-Biedl syndrome, Senior-Loken syndrome, Usher syndrome, and others. Some of these devastating diseases cause multiple organ failure that, in addition to vision loss, lead to deafness, developmental abnormalities like mental retardation and other life-threatening conditions such as kidney disease. The defects in the other tissues also appear to involve abnormal movement of molecules to or within cilia. It is imperative that we figure out how this molecular movement works, and what exactly goes wrong when people have genetic mutations that cause it to be interrupted. The Calvert lab has developed a custom-built laser scanning microscope that allows researchers to watch molecules moving inside living retinal photoreceptors. The microscope has allowed us to examine how proteins move from the cell bodies of photoreceptors into the photoreceptor cilium in normal cells. We have shown, for the first time, that proteins can enter the cilium by diffusion, a process that is similar to how the water in your mug changes color when you brew your morning tea. We also use our microscope to examine the movement of molecules in other cilia, like those found in the kidney, where some of the same genetic abnormalities that lead to loss of vision can also cause life-threatening and chronic kidney disease. Our live tissue microscopy tools, combined with mathematical models of protein movement by diffusion and by molecular motors as well as models of interactions between molecules, are beginning to shed light on the mechanisms of molecular movement in ciliated cells. Our goal now is to extend this work to proteins implicated in ciliopathic diseases.